You are currently browsing the Carpe DMM blog archives for June, 2011. Star Trek 3.5: Is There In Truth No Beauty? “Is There In Truth No Beauty?” is an episode I remember seeing when I was young, for the shocking premise of an alien being so ugly that the very sight of it will drive you insane. Said alien being is the ambassador Kollos of the Medusans (a name ripe with symbology), a species which is in fact a supremely peaceful and gentle. The Enterprise has the job of carrying Kollos back to his homeworld. The problem is, no human can safely look at him. He beams aboard the Enterprise with only Spock in the transporter room, wearing a protective red visor. It turns out Kollos is inside a box, so there’s no real danger. He is accompanied by a human, the attractive Dr Miranda Jones (played by Diana Muldaur, who would later play Dr Pulaski in The Next Generation), who has spent the past 4 years on Vulcan learning the mental discipline necessary to be in Kollos’s presence without going insane. She has psychic powers, but also harbours a raging jealousy towards anyone else who interacts with Kollos, which in this case includes Spock, who wants to (gasp!) say hello to Kollos. Also on board is Larry Marvick, one of the designer’s of the Enterprise engines, now with the job of adapting starships to allow Medusan navigators, since they are expert at celestial navigation. There is a tension between Larry and Miranda, with her rejecting his advances and his imploring that she leave Kollos to be with him. Soon after, Miranda psychically detects “murderous intent” in someone. Despite mentioning this to Kirk and Spock, they immediately dismiss and ignore it. Larry then enters Kollos’s quarters armed, but Kollos defends himself by opening his box, letting Larry see him, and thus driving Larry insane. Larry runs to engineering and sends the Enterprise flying off at incredible warp speed. Kirk arrives with a bunch of security guards – but instead of ordering the guards to stun Larry with phasers, Kirk launches himself at Larry, tackling him and initiating a fistfight. Kirk eventually prevails, but by this time they are outside the Galaxy! Larry promptly drops dead, eliciting a, “He’s dead, Jim,” from McCoy. Now faced with the problem of how to return to the Galaxy, Kirk and Spock decide only Kollos’s navigation skills can help them. Spock says he must mind meld with Kollos to allow Kollos to navigate and steer the ship through Spock’s body. Miranda objects jealously, saying she should do it. 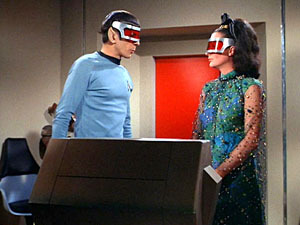 McCoy steps in, saying she can’t pilot the ship because… she’s blind! He’s deduced her secret – how she can be around Kollos constantly and go mad. Miranda keeps this from everyone because she doesn’t want pity, and uses a sensor web built into her dress to visualise her surroundings. She reluctantly allows Spock to meld with Kollos, which he does on the bridge, behind a screen shielding everyone else, and with his protective visor on. They navigate the ship back to where they started, then Spock goes to break the meld and forgets his visor! How on Earth does Spock forget such a basic safety precaution? 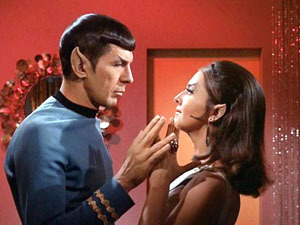 Miranda uses her psychic powers to fix Spock, and all ends well. There is a blatant moral to the tale, that the ugly Kollos was in fact a beautiful being, while the beautiful Miranda harboured an ugly jealousy – although that is turned around by her experiences. 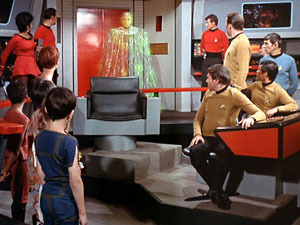 The episode ends with Spock and Kirk in the transporter room beaming Kollos and Miranda down to the Medusan homeworld. At this point Spock wears the safety visor, but Kirk, standing right next to him, doesn’t bother! Overall, this is an intriguing and refreshingly different episode. It has a decent story, which keeps you guessing, and some dramatic twists and turns. I rate it above average. Tropes: Literary Allusion Title, Go Mad From The Revelation, Take Our Word For It, Girl Of The Week, Psychic Powers, Love Makes You Evil, Death By Despair, He’s Dead Jim, Psychic Link, Dream-Crushing Handicap, Idiot Ball. Body count: Larry Marvick (dies of… insanity?). Next up is “And The Children Shall Lead“. It’s another permutation of the omnipotent alien and creepy kids themes, but this time combined into one for something different… oh wait, just like in “Charlie X“. Kirk, Spock, and McCoy beam down to answer a distress call from a scientific colony on Triacus, only to find the adults dead and the surviving five kids oblivious to the loss of their parents. They gather around the Enterprise trio and sing “Ring a Ring o’ Roses” – adding to the creepiness if you know the (discredited) theory about the nursery rhyme referring to the black plague. The crew bury the bodies, complete with a cheesy “UFP” (United Federation of Planets) banner on a stick – that the kids knock over in their eagerness to play games and ignore the sombre mood. Kirk checks out a creepy cave nearby, and expresses a strange feeling of anxiety, which Spock dismisses casually, despite the last records of the scientists being that they were overcome with fear. Spock’s logic circuits have apparently been short circuited. Back on board, the kids turn out to have psychic powers activated by shaking a fist in the air at their victims and making them see things they fear. Their victims include Sulu – who they get to pilot the ship to a populated planet, Uhura, and Scotty. They don’t bother controlling Kirk or Spock for some inexplicable reason, which would pretty much ensure their success – instead they leave them to figure out how to stop the kids. Spock recalls a detailed thousand-year-old old legend about Triacus – which is weird because they said the science expedition was the first time anyone had ever been there. This legend apparently tells of a mysterious malevolent force on the planet. Kirk decides to relieve the security detail on the planet and beams down two guards, not realising that the Enterprise has left orbit, meaning they get beamed into empty space. Kirk storms to the bridge and the kids turn him into a hammy simpering pile of anxiety. Spock drags him away and they regroup to try again, this time summoning the mysterious alien entity that directs the children by playing back a tape of their summoning chant. The alien stands by as Kirk then disempowers him by playing back videos of the kids playing with their parents, which results in the kids regaining their emotions and rejecting the alien, who simply fades away into nothingness. Well, it’s not a terrible story. There’s some intrigue and drama in how Kirk and Spock can possibly prevail, but the trouble is we’ve seen it all before (multiple times) and the omnipotent psychic kids fall prey to their own lack of planning more than any cleverness by the heroes. Ho hum. Slightly below average. Tropes: Sufficiently Advanced Alien, Creepy Child, Freudian Trio, He’s Dead Jim, Forgot About His Powers, Psychic Powers, I Know What You Fear, Kids Versus Adults, Thrown Out The Airlock, Large Ham, Summoning Ritual, Happier Home Movie. Body count: At least 7 science expeditionists, 2 redshirts beamed into space, the alien entity Gorgan. Bleah. “The Paradise Syndrome” is one of those episodes that really shouldn’t have been made. It’s just all-round horrible. Kirk, Spock, and McCoy are on an Earth-like planet – not just a bit Earth-like, but so Earth-like that it has pine trees. And “American Indians“. Not merely analogues, but “a mixture of Navajo, Mohican, and Delaware” as Spock declares. Breaking this astonishing recreation of ancient Earth, a weird metallic obelisk rears phallicly from the wilderness, inscribed with alien runes that fascinate Spock. In the closest thing the episode has to a plot, they reveal that their mission is to deflect an asteroid that will smash into this planet, and that they better leave within half an hour to go intercept it in time. The obvious question here is why are they even on the planet in the first place rather than out there intercepting the asteroid and then maybe later, when it’s safe, coming down to have a look around? Naturally, they split up to look around. Out of sight of the others, Kirk opens his communicator to talk to the Enterprise, and the obelisk opens up and he falls inside. Spock and McCoy don’t know where he’s gone, and Spock orders them back to the Enterprise to go deflect the asteroid, above McCoy’s protests that they need to stay and look for Kirk. Neither of them thinks to leave a search party on the planet while the ships goes to deal with the asteroid. Inside the obelisk, Kirk has his mind selectively erased, then emerges later to the wonder of some of the natives, who naturally assume the white man in their midst is a god. Kirk does not dispute this. He is led to the village, where the sceptical medicine man Salish expresses his scepticism. On cue, a drowned boy is brought in for Salish to heal, but he declares the boy dead. Kirk applies mouth-to-mouth and revives the boy, cementing his role as a god, and new medicine man. As medicine man, Kirk also gains the hand of the chief’s daughter and high priestess Miramanee, who was previously assigned to Salish. Salish is understandably disgruntled. Meanwhile, Spock destroys the Enterprise engines in a failed attempt to deflect the asteroid. The asteroid, by the way, is the size of Earth’s moon, but is all lumpy rather than spherical as any body that size should be. They limp back to the planet – at exactly the same speed as the asteroid, but just 4 hours ahead of it. It takes them 59 days to get there. In that time, Kirk goes totally native, marrying Miramanee, getting into a fight with Salish, and fathering Miramanee’s child! Back on the Enterprise, Spock forgoes eating in order to decode the alien symbols on the obelisk, saying they are musical notes, representing a sort of musical language, that tells about an ancient race called the Preservers, who seeded life forms all over the Galaxy – thus explaining why they keep coming across so many humanoids. He figures out (somehow) that the obelisk is an asteroid deflector! The natives somehow know doom is imminent and implore Kirk to save them by opening the obelisk (which is weird, because they never had to open it before for any reason). Kirk has no clue however, and everyone in the village turns on him and Miramanee, throwing styrofoam rocks at them. Kirk and Miramanee collapse, just as Spock and McCoy beam down. Spock mind melds with Kirk to bring his memories back. Kirk signals the Enterprise again – which for some bizarre reason happens to be the vocal key that opens the obelisk. Spock goes inside and turns it on, deflecting the asteroid. 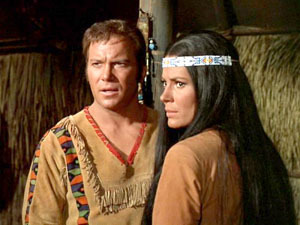 McCoy declares Miramanee too far gone to live, and the episode ends with Kirk sobbing over her body. Blah! An episode full of gaping plot holes, annoying stupidity, ridiculous science, and patronising attitudes. Take it away! Tropes: Mad Lib Thriller Title, All Planets Are Earth-Like, Braids, Beads, And Buckskins, Easy Amnesia, Mighty Whitey, God Guise, Amnesia Danger, CPR: Clean, Pretty, Reliable, Chief’s Daughter, Nubile Savage, The Native Rival, Space Does Not Work That Way, Going Native, Forgot The Call, Forgets To Eat, Boldly Coming, Precursors, Transplanted Humans, Disco Tech, Songs In The Key Of Lock. Body count: Miramanee, stoned to death. Back in the day, I used to get roughly one of my photos per month into Flickr’s Explore – the top 500 most “interesting” photos posted on the site on any given day. But the rate petered off and now I’ve had a drought that’s lasted almost two years – my last Explored photo was back in September, 2009. I figure it’s because Flickr has grown rapidly. There are more people uploading more photos, and that just makes it harder to attract enough attention to get a photo into the top 500 of an ever-expanding sample size. But I was pleasantly surprised to see a raft of comments and likes on this photo, which I posted a couple of days ago. 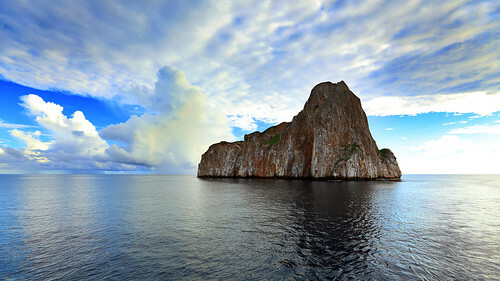 This is a shot of Leon Dormido (“Sleeping Lion”), a volcanic rock spire sticking out of the ocean a few kilometres off the coast of San Cristóbal Island in the Galapagos. It’s a nesting site for blue-footed boobies and magnificent frigatebirds. We circled the rock in our boat a couple of times at dawn to see the frigatebirds in their courtship displays – there’s no landing place on the rock. This shot is as we were leaving it behind, our last encounter with wildlife in the Galapagos. To me there’s that element of sadness in this image – something I guess nobody else picks up just from looking at it. Still, I’m very pleased with how this photo turned out. “The Enterprise Incident” is a spy thriller that begins with a mystery: Why is Captain Kirk acting so strangely, snapping at his crew and giving reckless orders that would ordinarily see him relieved of command on psychiatric grounds? McCoy begins the episode with a medical log observing Kirk’s irrational behaviour, immediately opening the question of why McCoy doesn’t act on it. Kirk orders the Enterprise across the Romulan Neutral Zone and into Romulan space, where it is quickly “surrounded” by 3 Romulan ships. How exactly 3 ships can “surround” another ship in 3-dimensional space is not explained. Furthermore the Romulans are now using Klingon-designed ships, for no readily apparent reason other than the Klingon ships look cooler. (Apparently there was a dispute with the builder of the original Romulan ship model, and the producers wanted to show off the Klingon ships more.) This implies things between the Romulans and Klingons that are never explored again as far as I know. Romulan Subcommander Tal orders Kirk and Spock to beam over for surrender negotiations, offering two Romulans as a hostage exchange. They meet the Romulan commander, who is shockingly a female. She throws Kirk in the brig, where he throws himself against the force door and injures himself, watched by a Romulan guard who is wearing incredibly amusing knee-length blue shorts. Meanwhile Spock engages in some weird alien seduction/courtship with the Romulan commander, after he assures her that Kirk is mad and acted without Starfleet authority, and she offers Spock the chance to be a starship commander in the Romulan Empire. Spock appears to consider this offer favourably. McCoy beams over to treat Kirk. When Spock and the unnamed Romulan commander arrive, Kirk calls Spock a traitor and leaps at him. Spock reflexively gives Kirk the “Vulcan Death Grip” and McCoy declares him dead! This is the climax of the building mystery in the episode around why everyone is acting so strangely, and it makes the first half of the episode compellingly watchable. Apart form the sneaking suspicion that something must be up, the viewer is left in the dark, and the mystery is deliciously tantalising. Back on the Enterprise, we learn that there is no such thing as a “Vulcan Death Grip” – Spock gave Kirk a variant of the nerve pinch to render him apparently dead. McCoy lets Nurse Chapel in on the secret – Kirk and Spock have been acting on Federation orders to sneak into Romulan space and steal a cloaking device, while planting false logs to give the Federation deniability and lay the blame entirely on Kirk if the mission goes belly up. This is the Federation we are supposed to see as the holder of impeccable moral standards in the Star Trek universe – one wonders what other black ops they are running without the knowledge of the citizens. This also means Spock has been lying through his teeth to the Romulan commander, despite him confirming to her that Vulcans are incapable of lying. This was also a bit odd to me, until I confirmed that canonically Vulcans can tell lies, if logic dictates that is an appropriate course of action. Spock’s duty to Starfleet outweighs his personal sense of honesty. But was it all a lie, or did he have feelings for the commander? This question is left dangling tantalisingly. McCoy performs plastic surgery on Kirk to give him the appearance of a Romulan – apparently prosthetic technology in the 23rd century has devolved so far that they can’t mimic 1960s TV show special effects except by using plastic surgery. He beams back to the Romulan vessel and pretends to be one of the exchange hostages when a Romulan guard questions him – a ploy which works surprisingly well, demonstrating that the Romulans take their security about as seriously as Starfleet does. Kirk finds the Romulan cloaking device in a room, guarded by a single guard who he takes out with an amateurish kung fu move (again demonstrating the tissue-thin Romulan security). He unscrews the device and beams back to the Enterprise with it, where he asks Scotty if he can hook it into the Enterprise to cloak the ship. Scotty is justifiably dubious about the very possibility of this; Kirk gives him 15 minutes. Kirk then beams Spock back, after Chekov identifies him from the Romulans with a sensor scan. Spock was, unfortunately, in the middle of recording a complete confession of Starfleet’s secret orders for the Romulan commander, as part of his last statement before being executed. In a wrinkle, the Romulan commander grabs Spock as he is being beamed away, and is now on the Enterprise. When Kirk opens communication with Tal, she orders him to destroy the Enterprise (with her on it). Kirk orders Warp 9 (the fastest the ship has gone under normal engine power so far, I think)! The Romulans pursue and are about to destroy the Enterprise (“in 12.7 seconds“), but 15 minutes have now passed and Scotty has soldered the device into the ship, and miraculously it works, apparently without requiring any sort of modification to the Enterprise itself, such as, say, cloaking field generators around the hull, or anything. And so they make off with a grand prize – a Romulan cloaking device, which can now demonstrably be used in Federation starships. Except the Federation never uses this technology, in this or any other incarnation of Star Trek. So what was the point of the whole mission? And violating the Neutral Zone is an act of war – how did this mission not trigger all-out warfare between the Federation and the Romulans? These two gaping plotholes aside, this is not a bad episode. It’s very watchable and keeps you hooked throughout. Above average. Tropes: Mad Lib Thriller Title, Chair Reveal, Samus Is A Girl, Force Field Door, Space Clothes, Duel Of Seduction, No Name Given, Face Palm Of Doom, Faking The Dead, Sealed Orders, Super Dickery, Cannot Tell A Lie, Was It All A Lie?, Dressing As The Enemy, We Will Not Use Stage Makeup In The Future, Ludicrous Precision, Plug N Play Technology, Impossible Task Instantly Accomplished, Forgotten Phlebotinum. One of my favourite photos from my recent trip to South America. 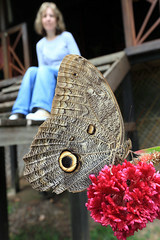 This is a species of giant owl butterfly, taken in the Peruvian jungle near Puerto Maldonado, a stone’s throw from the Rio Madre de Dios, which is the largest tributary of the Amazon. This is probably the biggest butterfly I’ve ever seen. Unfortunately I can’t quite identify the exact species of owl butterfly. It somewhat resembles either the Forest giant owl butterfly (Caligo eurilochus), Idomeneus giant owl butterfly (Caligo idomeneus), or Illioneus giant owl butterfly (Caligo illioneus), but not enough that I’m positive about an identification. It may be another species I haven’t managed to find good pictures of to make a comparison. If anyone can make a positive ID, I’d be grateful. And so we move into season 3, which opens with “Spock’s Brain“, perhaps the single most infamously bad episode of Star Trek. As such, I wasn’t particularly looking forward to rewatching it. But undaunted, I plunged in headlong for the sake of completeness. The episode opens with a noticeably long period of silence – the timer on my DVD player hit 47 seconds before anybody said anything. During this time, we see a strange vessel closing on the Enterprise. Scotty announces it has “ion drive”, which sends everyone into raptures of wonder at what is apparently a technology far in advance of what the Federation commands. Which is interesting, as we launched our first ion drive equipped test mission in 1964… oops, 4 years before this episode was released. Suddenly a woman appears on the bridge and everyone falls unconscious. When they come to, Spock is in sickbay, with his brain missing! Miraculously, Spock’s body is still operational, as McCoy explains that all the nerves have been sealed off with astonishing precision beyond his medical abilities. Interestingly, the diagnostic readout above Spock’s bed shows a non-zero value on the “brain” reading. McCoy states they have 24 hours to find and restore Spock’s brain before his body dies – apparently an exact time limit because later in the episode they count it down by the minute. Kirk resolves to find the woman who evidently took Spock’s brain and follows an ion trail to a planet in the grip of an ice age. Kirk, Scotty, Chekov, and two guards beam down to the icy surface and Kirk tells them, “Set temperature to 72.” They twiddle a knob on their wrists and stop shivering! So apparently they have some sort of personal heat fields to avoid freezing on cold planets – if only they’d given one to Sulu back in “The Enemy Within“. The landing party spreads out, with absolutely no semblance of a plan of action, or idea of where to look for the woman or Spock’s brain. A bunch of cavemen attack them and they capture one in the ensuing fist fight (naturally their phasers get knocked away first thing). He speaks English, but he has no word for “woman” – which is naturally the first thing Kirk asks him about. The native seems scared of ones he refers to as “the others”, and urges Kirk not to go looking for them. Kirk immediately does so, and finds a cave rigged as a trap. They escape, there’s a fist fight with some enslaved males form the surface… ho hum… They find Spock’s brain in a machine that is running the city. 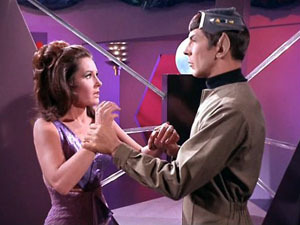 They argue with Kara about returning Spock’s brain. Kirk wonders how Kara could have removed the brain so expertly, when she evidently doesn’t know anything about science or technology. Kara reveals that the Controller must be replaced every thousand years or so, and then one of the women dons a teaching helmet that infuses them with virtual omniscience temporarily. Shades of the Krell educator from Forbidden Planet. Kara watches mutely as McCoy dons the teacher and gains enough medical knowledge to re-implant Spock’s brain, which occurs in a comedic sequence in which he reconnects Spock’s speech centres first and then Spock makes amusing comments for the remainder of the operation. Kirk proposes that the Federation help Kara’s people to reunite male and female and develop as a more normal society without a Controller. Spock starts going into the fascinating history of the planet and Kirk tries to turn him off with the remote control device, prompting everyone to laugh. Annoyingly, the subject of how the males and females of the planet have survived for thousands of years without interacting is never even raised, let alone explained. There’s the blackboard-scrapingly painful sexism of the dialogue. And there’s the absurdity of Spock’s brain being removed (why didn’t Kara simply kill Spock? That would have sidestepped any attempt to restore him.). But you know, despite all of this, this is not the worst episode. In this series of reviews I’ve already been exposed to worse episodes, and I know there’s at least one more to come in series 3 that outshines this one for offensiveness. And the plot of this one is actually kind of interesting. If you ignore the absurdity of the brain thing, it’s not a terrible mystery plot, with a tense chase across the Galaxy, a mysterious civilisation to investigate, and an interesting moral decision to be made about the well-beings of Spock and an entire civilisation. It’s still well below par, but honestly I don’t think this episode is as bad as its reputation. Tropes: Who Even Needs A Brain?, It’s A Small World After All, Good Old Fisticuffs, Handy Remote Control, Elaborate Underground Base, Shock Collar, Agony Beam, Wetware CPU, Brain In A Jar, Terminally Dependent Society, Cool Helmet, Neutral Female, Everybody Laughs Ending. I’d been on a trip to New York, and as usual I’d taken a lot of photos. In particular, there was one street scene of the surrounding architecture that I’d been pleased to spot, and had composed a lovely photo to capture it. But when I got back home and reviewed my photos, that one shot hadn’t turned out exactly as I’d planned it, for some reason. So the next weekend, I left work on Friday afternoon, went to the airport, and hopped on a flight to New York. Some 24 or so hours later I was in New York, left the airport, got a taxi to the exact same location on the street, recomposed the photo, took it, hopped back in the taxi and went straight back to the airport, where I hopped on a flight home, just in time to go to work on Monday morning. I didn’t even get to see how the re-taken photo turned out.